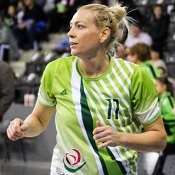 Ildiko Nagy is an heavily experienced power forward/center, having a long CV of personal accomplishments. Alongside with her big (international) experience comes her big basketball IQ which she uses on court, as she has very solid interior moves, playing well with her back against the basket and being a threat as well when facing up to the rim. She posses double citizenship, Romanian and Hungarian.